In connection with TCM Spotlight's 50 Movies in 50 States, TCM Backlot held a contest called "50 Fans in 50 States". 50 Fans in 50 States would have one winner per state. To enter one simply had to tell about the connections to movies one's state has. I am proud to say that I won the contest for the state of Missouri. In a way I feel lucky to be from Missouri, in that we have more connections to movies than some states. Indeed, I live only twenty minutes away from the hometown of legendary camera man Elgin Lessley and an hour a way from the hometowns of Walt Disney, Cliff Edwards, and Steve Mcqueen (I also live an hour away from Mary Astor's hometown of Quincy, but it is in Illinois...). And, of course, Vincent Price, Virginia Mayo, and Ginger Rogers were all born here! Anyway, if you want to read my entry, you and you are a member of TCM Backlot, it will be under "50 Fans in 50 States, Round 2". By the way, I don't know what I have won. TCM Backlot simply said we will receive a prize in the mail, not what it is! One of the things I love about the website Letterboxd is keeping track of the films I have watched. The site has a diary where one can enters the movies one has watched and it also has a list of the films one has watched by their release dates. Among other things, one can learn how many films one has watched in any given decade. I joined Letterboxed in December 2011, so it hardly includes every single film I have seen in my life. That having been said, I have used it faithfully ever since I joined, so it includes every film I have watched since December 8 2011. The breakdown of the decades is then accurate. I am only including the decades up to the Eighties here, as I think a film has to be thirty years old before it is considered a classic. As to why there are so few films from the Twenties, sadly, I haven't watched much in the way of silent films the past several years. Every year I think I will watch more and I never get around to it. When 9th Street Video in Columbia was open I watched many more silent films! It doesn't help that TCM only seems to show them on Sundays and the DVDs tend to be pricey! As to why there are so few films from the Seventies and Eighties, well, I really don't care much for movies from those decades! Obviously my favourite decade for film is the Sixties. I was going to break the films down by genre as well, but Letterboxd seems very inaccurate with regards to classifying films by genre. For example, they include the Pixar film Inside Out, under drama! I fear to get an accurate count of the different films in the various genres I would have to do so manually. Anyway, if you don't have a Letterboxd account, by all means create one. I have enjoyed using Letterboxd over the years and it is very interesting to look back at what I have watched. Update: I was just looking over Letterboxd and noticed that The General,, Nosferatu, and Sherlock Jr. are not listed among the movies I have watched. I then have to question the accuracy of their films they list me as having watched for the Twenties! I know I have watched both The General and Nosferatu multiple times. Robert Dix, who appeared in movies from Forbidden Planet (1956) to The Rebel Rousers (1970), died on August 6 2018 at the age of 83. Robert Dix was born on May 8 1935 in Los Angeles, California. He had a twin brother, Richard Dix Jr., who died in a logging accident when they were 18. His father was movie star Ricahrd Dix, who died when Robert Dix was only 14. Robert Dix studied acting at National Academy of Theatre Arts in Pleasantville, New York. He was signed to a seven year contract with MGM when he was only 18, by way of a family friend (MGM executive Tom Tannenbaum). Robert Dix made his film debut in an uncredited role in Athena in 1954. He appeared in uncredited roles in such films as The Glass Slipper (1955), Love Me or Leave Me (1955), and The Scarlet Coat (1955). His first credited role was in The King's Thief in 1955. Robert Dix's last role with MGM would be the classic Forbidden Planet (1956), in which he played Crewman Grey. He finished out the Fifties appearing in such films as Forty Guns (1957), Frankenstein's Daughter (1958), 13 Fighting Men (1960), and Young Jesse James (1960). He made his television debut on an episode of Lux Video Theatre in 1956. In the Fifties he appeared on such shows as Studio 57; Richard Diamond, Private Detective; Highway Patrol; Mike Hammer; Death Valley Days; Sky King; Frontier Doctor; and The Rifleman. In the Sixties Mr. Dix guest starred on Gunsmoke and Rawhide. He appeared in such films as Air Patrol (1962), Deadwood '76 (1965), Las Vegas Strangler (1969), Blood of Dracula's Castle (1969), Satan's Sadists (1969), Wild Wheels (1969), Hell's Bloody Devils (1970), Horror of the Blood Monsters (1970), and The Rebel Rousers (1970). In the Seventies he appeared in The Red, White, and Black (1970) and he had a cameo in Live and Let Die (1973). He is slated to appear in the upcoming film The Last Frankenstein this year. Robert Dix was a capable actor who played a diverse number of roles. While many of his films would hardly qualify as classics (at least not classics in the way that Casablanca or Citizen Kane are), his performances were always fairly solid. Over the years he played everything from Frank James to military officers to psychopaths. Charlotte Rae, who played Officer Leo Schnauser's wife Sylvia on the classic sitcom Car 54, Where Are You?, and starred on the shows Hot L Baltimore, Diff'rent Strokes, and The Facts of Life, died on August 5 2018 at the age of 92. Charlotte Rae was born Charlotte Rae Lubotsky on April 22, 1926 in Milwaukee, Wisconsin. Her family later to moved to Shorewood, Wisconsin. As a teen she worked in radio and at 16 was an apprentice with the Port Players, a local Milwaukee theatre company. She attended Northwestern University in Evanston, University, but did not graduate. She moved to New York City in 1948 and performed in both theatres and clubs. Charlotte Rae made her television debut in 1951 in an episode of Once Upon a Tune. In the Fifties she appeared on such shows as The United States Steel Hour, Armstrong Circle Theatre, Kraft Television Theatre, The Philco Television Playhouse, The Phil Silvers Show, and Play of the Week. She made her debut on Broadway in Three Wishes for Jamie in 1952. In the Fifties she appeared on Broadway in a revival of Threepenny Opera, The Golden Apple, The Littlest Revue, and Li'l Abner. In the Sixties she played Sylvia Schnauser on Car 54, Where Are You?. She guest starred on such shows as Way Out, Look Up and Live, The Defenders, and ABC Stage 67. She made her film debut in Hello Down There in 1969 and appeared in the film Jenny (1970). She appeared on Broadway in The Beauty Part; Pickwick; Morning, Noon and Night; and The Chinese and Dr. Fish. In the Seventies Charlotte Rae played Molly the Mail Lady on Sesame Street and starred on Hot L Baltimore, The Rich Little Show, and Diff'rent Strokes. She guest starred on Temperatures Rising, The Partridge Family, McMillan & Wife, Love American Style, The Paul Lynde Show, All in the Family, Good Times, Phyllis, Barney Miller, Our Town, CPO Sharkey, and Hello Larry. She appeared in the films Bananas (1971), The Hot Rock (1972), Sidewinder 1 (1977), Rabbit Test (1978), and Hair (1979). She appeared on Broadway in Boom Boom Room. In the Eighties Charlotte Rae reprised her role as Edna Garrett on the Diff'rent Strokes spinoff The Facts of Life. She guest starred on The Love Boat; St. Elsewhere; Murder, She Wrote; and 227. In the Nineties she provided voices for the television cartoon series The Itsy Bitsy Spider, 101 Dalmatians: The Series, and The Brothers Flub. She guest starred on such shows as Baby Talk, Sisters, Can't Hurry Love, and Diagnosis Murder. She provided a voice for Tom and Jerry: The Movie (1992) and appeared in the film Nowhere (1997). From the Naughts to the Teens she appeared in the films You Don't Mess with the Zohan (2008), Christmas Cottage (2008), Love Sick Love (2012), and Ricki and the Flash (2015). She guest starred on the shows Strong Medicine, The King of Queens, ER, Life, Pretty Little Liars, and Girl Meets World. I have state here that I have never been a fan of either Diff'rent Strokes or The Facts of Life, but I always thought Charlotte Rae was a wonderful actress with a particular gift for comedy. She was the perfect Sylvia Schnauser on Car 54, Where Are You? and she made many memorable guest appearances over the years. From The Partridge Family to All in the Family, she appeared on a number of different shows. 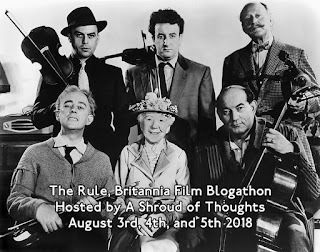 I just wanted to thank all the participants for making the 5th Annual Rule, Britannia Blogathon a success. This year we had a wide array of posts spanning British film history from the 1930s to the 1990s. Several different genres were covered as well, everything from comedies to musicals to science fiction films. If you want to read all the posts, you can access them here. Thanks to all the participants again!